Read the IBM point of view (267 KB) What’s your potential ROI? Technological disruption has come to insurance — and the smart risk management strategy is to embrace it. 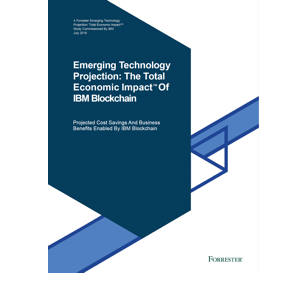 IBM Blockchain is helping the insurance industry radically transform operations with faster verifiable data exchanges, visibility for all parties, and transactions underpinned with pervasive security and trust. One example of this transformation is openIDL, a network built on the IBM Blockchain Platform with the American Association of Insurance Services (AAIS). They’re automating insurance regulatory reporting and streamlining compliance requirements, and that’s improving efficiency and accuracy for both insurers and state insurance departments. IBM offers deep expertise in blockchain and insurance, advising clients on how to use this technology to re-shape the industry. And we’re making significant contributions to The Linux Foundation’s open source Hyperledger technology, on which the IBM Blockchain Platform is built. Global insurance broker Marsh transforms the proof of insurance process from complicated and manual to streamlined and transparent, allowing clients to speed up hiring contractors and transferring risk while increasing coverage certainty. AIG and Standard Chartered have teamed with IBM Blockchain to create a new multinational insurance policy. Learn how we’re working together to strengthen transparency, increase trust and reduce cost and friction. Reinvent your insurance business with IBM Blockchain.